Welcome to 2017. It's time to repeal Obamacare. Congress returns to work this week and dismantling Obamacare is at the top of its to-do list. Broad legislation to repeal and replace Obamacare would require 60 votes in the Senate, and Republicans don't control enough seats to make that happen or to squash a filibuster by the Democrats. Instead, Republican lawmakers are expected to gut key provisions in the law using the budget reconciliation process. This process is limited to provisions that affect federal revenues and spending and requires only a simple majority to pass. It would enable Congress to repeal the Obamacare mandates that individuals have coverage and that companies with 50 or more employees provide workers with affordable insurance. Also, it can do away with the federal subsidies, eliminate funding for Medicaid expansion and cancel a multitude of Obamacare-related taxes. Lawmakers are hoping to start the budget reconciliation process soon after they return to work Tuesday, though it may take a couple of months -- or potentially longer -- before they can get the repeal bill to Trump. And it may take even longer to say goodbye to these Obamacare provisions. Since Republican lawmakers don't have a replacement plan ready, they are expected to delay the repeal from taking effect for at least two years. The so-called "repeal and delay" tactic, however, is not sitting well with some in Congress, particularly a few top GOP senators. Senator Lamar Alexander, who chairs the health committee, said if the process is rushed, harm may be done or mistakes made. These senators would like to wait until a more solid replacement plan is in hand so it's possible they will try to slow down the reconciliation process. The Obama administration and Democratic lawmakers are also promising to make things difficult. They are touting the fact that a record number of people have signed up for coverage so far. And they are emphasizing how much Obamacare means to Americans, asking them to share their stories using the hashtag #CoverageMatters. Minority Leader Nancy Pelosi is requesting that other congressional members hold events in mid-January, highlighting the risks of Republicans' plans for Obamacare and Medicare. Also, Democrats and insurers are warning that any delay in replacing Obamacare could throw the individual insurance market into chaos for 2018. Insurers don't have time to wait around and see if they like what Republicans propose. They must submit their initial rate filings for 2018 to state regulators in May and sign contracts by September. Republicans, however, may need more time than that to replace Obamacare. Maintaining coverage for those with pre-existing conditions and for low-income Americans could prove especially vexing since these groups are often costly to insure. Only one repeal-and-replace bill has ever made it to the desk of President Obama, who vetoed it in early 2016. That bill would have increased the number of uninsured by 22 million, according to an analysis by the non-partisan Congressional Budget Office. However, the legislation provides a framework for how Republican lawmakers -- particularly House Speaker Paul Ryan and House Budget Committee Chair Tom Price, who is Trump's pick for health secretary -- would replace Obamacare. Tax credits instead of subsidies: Instead of providing federal subsidies to help people afford their premiums, Republicans would give refundable tax credits to those who buy policies in the individual market. Republicans would adjust the credit by age, instead of income, as Obamacare does. Ryan, in his "A Better Way" plan, does not provide details. But Price's "Empowering Patients First Act" lays out how much people would receive, ranging from $1,200 for those ages 18 to 35 to $3,000 for those age 50 and up. The Republican plan would help more middle class Americans, who make too much to qualify for Obamacare subsidies. But the tax credits could prove much less generous for many lower- and moderate-income Obamacare enrollees who do receive the subsidies, which can lower the cost of coverage to just under 10% of their annual income. High-risk pools for the sick: Republicans would set up a two-track system to cover people with pre-existing conditions: one for those who maintain continuous coverage and one for those who don't. Those who are currently covered could not be dropped from their plans or be prevented from renewing them because they are sick. And insurers can't charge them higher premiums. For those with a pre-existing condition who haven't maintained continuous coverage, the GOP would bring back state-based high-risk pools, which were largely shut down after the Obamacare exchanges became operational in 2014. Ryan's plan would funnel $25 billion over 10 years to the pools, while Price's would provide $1 billion annually over three years. This falls far short of what some experts say is needed. Covering the majority of uninsured Americans with pre-existing conditions through a national high risk pool would cost an estimated $178 billion a year, according to a 2014 Commonwealth Fund report. Medicaid block grants: Republicans would limit how much the federal government spends on the health insurance program for the poor. Most plans call for providing states with a fixed amount of money under a block grant program or a set grant per enrollee, known as a per capita grant. The GOP would also encourage states to design plans that fit their needs. More would be allowed to charge premiums or co-payments or adopt work requirements, for instance. Ryan's plan calls for freezing the number of states that have expanded Medicaid under Obamacare and would limit the funding for covering low-income adults. Price does not address Medicaid in his proposal beyond repealing expansion. Under Obamacare, states can opt to expand their Medicaid programs to cover all low-income adults up to 138% of the poverty level, or about $16,400 for an individual. The federal government covered 100% of the expansion population's costs from the provision's debut in 2014 through 2016. That rate will gradually decrease to 90% by 2020. So far, 31 states plus the District of Columbia have signed on. Bolstering Health Savings Accounts: Health Savings Accounts are a favorite policy tool of Republicans. Trump, Ryan and Price all mention them in their plans. HSAs are only available to people with high-deductible health plans. Those participants can make tax deductible contributions toward current and future health care expenses. Any savings they don't use can remain invested and grow tax-free. One of the goals of HSAs is to entice more people to enroll in high-deductible plans, which are seen as a way to slow the growth of health care spending since consumers must shell out more from their own pocket. 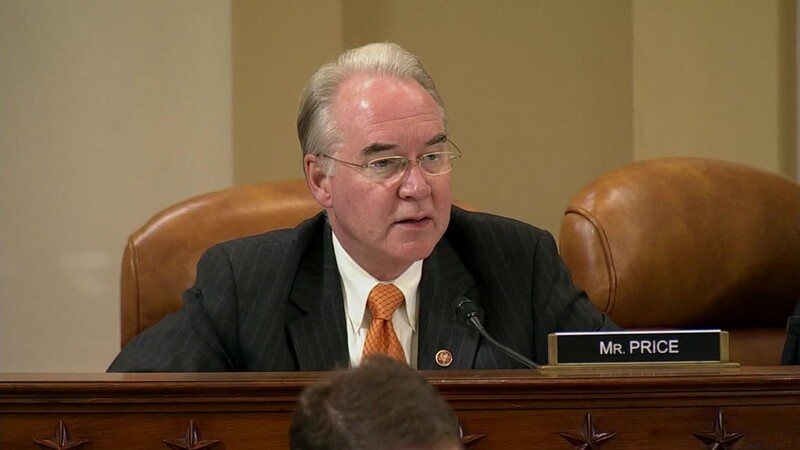 Price would provide a $1,000 one-time refundable tax credit for contributions and would increase the amount people could sock away in these accounts, up from the current $3,350 for individuals and $6,750 for families. He would broaden eligibility, protect the accounts from bankruptcy proceedings and allow older Americans to transfer their required minimum distribution from their retirement accounts into their HSAs. Ryan, meanwhile, would expand the maximum contribution to the account so it would equal an enrollee's deductible and out-of-pocket expense limit. And he would allow more people to participate, such as military members enrolled in TRICARE. Capping employer-sponsored plans: Both Obamacare and Republicans want to keep the cost of employer-sponsored insurance in check to deter companies from offering overly generous plans. Economists argue this would help slow the rise in health care costs and raise more revenue for the federal government. Obamacare aimed to do so through the so-called Cadillac tax, which was to impose a 40% tax on the value of policies above $10,200 for single coverage and $27,500 for family coverage in 2018. However, the provision was despised by companies and unions alike, and its implementation was delayed to 2020. Ryan and Price would limit the tax exclusion on work-based insurance coverage. Ryan doesn't provide details, but Price would cap the benefit at $8,000 for individuals and $20,000 for families. About 150 million Americans are insured through their jobs. The average individual policy cost $6,435 in 2016, while the family premium was $18,142, according to the 2016 Kaiser/HRET Employer Health Benefits report. CNN Senior Congressional Producer Deirdre Walsh contributed to this story.